It was only around the mid 1980s that the world finally recognized the dangers posed by the build-up of chlorofluorocarbons (CFCs) in the atmosphere. A big hole in the ozone layer revealed at the time by a team of scientists from the British Antarctic Survey showed what these sort of chemicals withering through the atmosphere could do. Luckily, CFCs have become regularized since then, yet apparently there are still other chemicals being funneled into the atmosphere. University of East Anglia report in recent study that they have identified four new gases that destroy ozone – the sources of these gases have yet to be discovered. 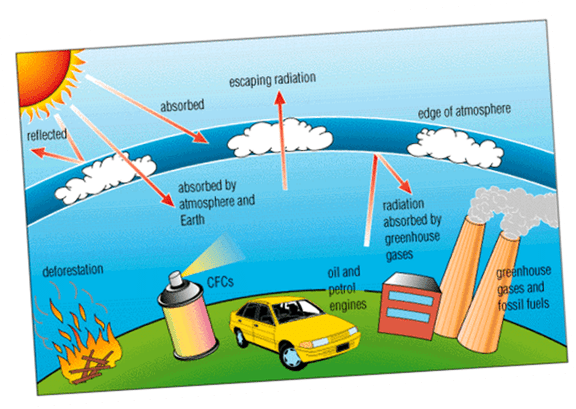 Sitting between 15 and 30 km from the Earth’s surface, the ozone layer is paramount to life on Earth as it filters the sun’s dangerous ultraviolet rays. The Montreal Protocol that came into effect on 1987 limited the release of CFCs, substances that were once widely used in refrigeration and as aerosol propellants in products like hairsprays and deodorants. It wasn’t until 2010 that a global ban on production altogether was enforced. Now, the University of East Anglia researchers report the discovery of four new gases with destructive capabilities against the ozone. Three of these are also CFCs and one is a hydrochlorofluorocarbon (HCFC), which can also damage ozone. The findings came after polar firn ( perennial snow pack) in addition to modern air signatures were analyzed. This snow is like a sort of natural archive which can tell scientists how air quality looked like up to 100 years ago. The data suggests that these four gases weren’t present in the atmosphere at all until the 1960s and that about 74,000 tonnes of these gases have been released into the atmosphere. Two of the gases are still accumulating at high rates, suggesting that whatever the source may be it’s still at it. “The identification of these four new gases is very worrying as they will contribute to the destruction of the ozone layer,” said lead researcher Dr Johannes Laube. “What’s more, the three CFCs are being destroyed very slowly in the atmosphere – so even if emissions were to stop immediately, they will still be around for many decades to come,” he added. Of course, the concentration of any of these gases, CFC-113a being the most powerful emission of the four, is far from being alarming, yet it’s imperative that the exact sources of these ozone destroyers be found in order for prevention efforts to come into effect. In other related news, I wrote earlier about another recently discovered man-made gas, this time a greenhouse gas, called perfluorotributylamine, or PFTBA, which is 7,100 times worse than CO2. Findings were reported in a paper published in the journal Nature Geoscience.